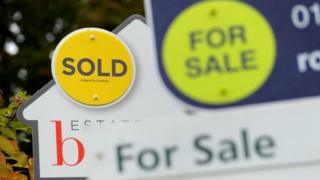 House prices in the East Midlands rose at more than three times the pace of London in the past year. Property prices in the region rose by 7% in the year to October - the fastest in the UK, the Office for National Statistics (ONS) said. The slowest house price growth over the same period was a 2.1% rise in London. However, average prices in the capital remain the highest at £481,000, compared with a UK average of £224,000, the ONS figures show. The typical UK house price rose by £10,000 compared with a year earlier, but was £1,000 lower than in September. Jonathan Samuels, chief executive of lender Octane Capital, said: "London continues to lag behind the rest of the country in terms of annual price growth. "But London's slowdown is no fall from grace, just a necessary correction following the exuberant price growth of a few years ago. Prices in certain London boroughs are still stratospheric compared to other areas of the country. "The fact that you can still buy 15 houses in Burnley for the price of just one in Kensington and Chelsea is a case in point." The ONS figures show prices rose by 6% in Northern Ireland in the 12 months to the end of October, compared with 4.7% in England, 4.5% in Wales, and 2.8% in Scotland. UK average house price growth was 4.5% in the year to the end of October, compared with 4.8% annual growth a month earlier. Separate ONS figures show that rent paid by tenants in Britain to private landlords rose by 1.4% in the 12 months to November, down from 1.5% a month earlier. The East Midlands region, which includes Nottingham, Derby and Leicester, again saw rents rise fastest, going up by 2.7%.